In the evening of June 18, 1947,* six convicted Japanese war criminals were hanged** by the U.S. Navy War Crimes Commission on Guam. 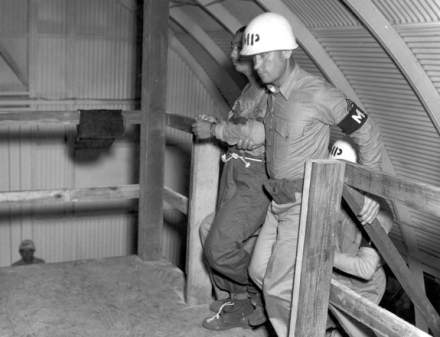 An unidentified Japanese prisoner ascends the gallows on Guam. The most lastingly notable of the six was Rear Admiral Shigematsu Sakaibara, who was hanged for ordering (and perhaps in one instance, personally conducting) an infamous mass execution on Wake Island that has already appeared in these pages. For some, the hanging of one of these six men had been a horrible tragedy and perhaps even a mistake. Rear Adm. Shigematsu Sakaibara had enjoyed the reputation of “gentleman soldier” and protector of the common man. Hailing from a wealthy family near Misawa in Tohokhu province, some 450 miles north of Tokyo, Sakaibara never forgot his roots. Forever poking fun at the fast-paced Tokyo lifestyle, the rear admiral touted the value of rural living, the integrity and honesty of those who lived in Japan’s rugged north country, and Tokyo’s need to recognize their great contributions to the war effort. Contemplating a postwar political future, he would be following in the footsteps of his politically influential family in northern Japan. That future was linked to championing the rights of returning veterans and other have-nots. Misawa had indeed had a heroic reputation as an important navy town and base for years. Sakaibara had assisted in the training exercises held there for the Pearl Harbor attack plan in late 1941. His future seemed golden no matter who won the war. But what some in his command called “The 1943 Incident” changed all that. 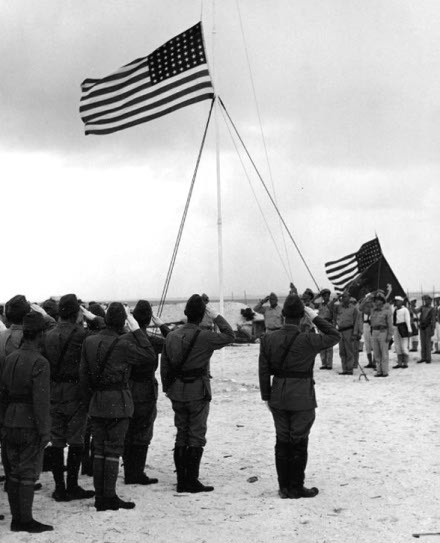 Shigematsu Sakaibara (right foreground) surrendering Wake Island on September 4, 1945. These events, Sakaibara admitted in his trial, had taken place in an atmosphere of near starvation and impending doom. The defense counsel especially emphasized that point, asking the commission to understand and respect the pressures and strains on Sakaibara at the time of the incident. But the commission was not in a forgiving mood. In the chaos of retreat or not, innocent civilians had been murdered. … Unfortunately for Sakaibara, several members of his former command expressed surprise on the witness stand when asked about the desperate situation on Wake in 1943. These men insisted that Sakaibara and his defense team’s description of a starving, chaotic Wake was an exaggerated one. There had been no unexpected miseries, confusion, or sense of peril, they said. Sakaibara’s fate was sealed. True to form, defendant Sakaibara offered a very literate final statement to the commission. In contrast to so many of his colleagues on trial in Tokyo, on Guam, or elsewhere, Sakaibara, albeit with carefully picked words, admitted he was guilty of rash and unfortunate actions. He appeared especially convincing when he noted that he wished he had never heard of Wake Island. But his most memorable comments involved his own view of morality in war. A nation that drops atom bombs on major cities, the rear admiral explained, did not have the moral authority to try so many of his countrymen. With Hiroshima and Nagasaki in mind, Sakaibara claimed there was little difference between himself and the victors over Japan. With that statement a legend grew, particularly in his home town, of Sakaibara, the victim of American revenge. … As late as the 1990s, some people there, not necessarily of the World War II generation, still bowed in reverence to Sakaibara family members out of respect for the “sacrificed” gentleman soldier. I think my trial was entirely unfair and the proceeding unfair, and the sentence too harsh, but I obey with pleasure. * Some sources places the executions on June 19; the U.P. wire story, dated June 19th, referred to the hangings occurring “last night,” and the preponderance of evidence I have been able to locate appears to me to support the 18th rather than the 19th. The United States Navy had hanged fewer than a handful of men in more than a hundred years … Now on Guam they had all kinds of Japanese to try and sentence to death … They had to requisition an Army executioner to show them how to hang. He was a lieutenant with silver-rimmed glasses, a leading-man moustache, and a paunch. He used the traditional British drop formula, but he was an innovator as well: He invented a method of lowering the dead body to the stretcher without having to cut the rope.